Have had a knitting filled week or two; from documenting the 1846 Dales glove up in Grasmere, to figuring out how to knit an 1860’s child’s stripey sock, to putting the finishing touches to our inland waterways ganseys and Yorkshire Dales knitting projects for the book. I’m even dreaming in knitting at the moment. That’s how bad (good?) it is. Sadly, I’ve found suicides, dead sailors, and sailors committing crimes to be the most fertile ground for finding descriptions of 19thC ganseys. Some of the ganseys are less conservative than we’d imagine. I dug a bit deeper in search of the 19thC stripe. Stripey knitting is nothing new. It’s always been a good way to stretch a favourite colour, and a thrifty way to use up odds and ends. (Given the list of patrons, the book is Edwardian, and wrongly dated at 1800 in the Richard Rutt collection of digitised knitting manuals, here). We now think of ganseys as having been blue, or cream or grey for Sunday best. But some of them most have put Joseph’s Amazing Technicolour Dreamcoat to shame! The American Civil War Soldier’s hood knitted from odd lengths of various yarns on p 47 of Susan Strawn’s “Knitting America” demonstrates this tendency, in extremis, for knitters to work with oddments and knit stripes. In his seminal ‘Glorious Colour’, back in the 1980s, Kaffe Fassett documented how his first efforts at colourwork were also stripes. And as sophisticated as his colourwork got, he still reserved a section of the book for stripes and how to knit them well. She suggested mauve and white, or scarlet and grey as good colour combinations. I found many mentions of this latter pairing. Often they seem to have striped a natural colour like cream or grey with a vividly dyed colour, usually scarlet or blue. Any excuse to link to the lovely Mr Laing must, of course, be exploited. His stripes, like many Victorian stripes, appear to have been quite narrow and very uniform. Sports clothing is one obvious place to find early stripes. The Grimsby team from 1878 may well have had a mix of hand and machine knit jerseys, given the non uniformity apparent in the whole-team shot. Grimsby, of course, would not be short of competent fine gauge hand knitters. So stripes were good for tennis and football, in the mid 19thC. Something about stripes said “Sporty!” Cricket jumpers were not yet the V neck white cabled things we expect them to have been, and I have seen an early shot of a local cricketer, wearing what looks remarkably like a late 19thC cycling jersey. I wouldn’t be at all surprised if stripes didn’t crop up there, too. When I asked on Ravelry about stripes in old knitting, some kind person linked to the Met Museum’s rather splendid stripey stocking. It may well be frame knit, but it’s still fascinating to look at. 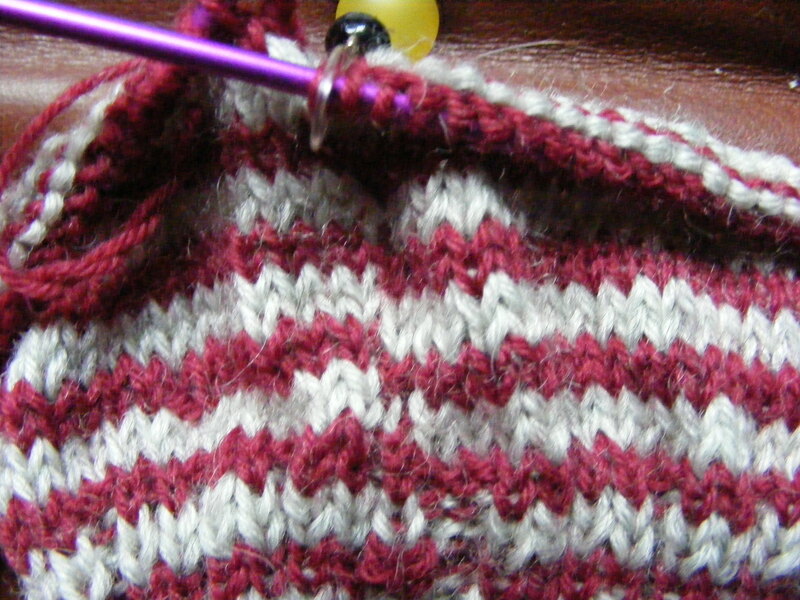 When you knit stripes in the round (far more elegant and satisfying than trying to knit them flat), you discover that annoying little jog at the start and end of your round. The Victorians got round this neatly, by purling a seam st (or two sts next to eachother) every round or every alternate round, like in my first pic here. This totally masks the jog. Contemporary knitters do some magic called a ‘jogless join’, for which you can find numerous good tutorials online. I found the jogless join not neccessary when I knitted Miss Ryder’s stripey sock, as she tells you to purl at the back seam each round and, as you can see, that sorts the dilemma. The child’s socks in the 1860 William W. Nichol painting ‘Quiet’ was my starting point for the next ‘Knitting Genie’ article. We have permission from York Museums Trust to reproduce the painting and also a detail of the sock, for knitters who’d appreciate, in trainspotterly fashion, a really good close up of some well painted 19thC knitting – you are urged to look out for the christmas edition of ‘Knit’. The painting is currently hanging in York Art Gallery, for anyone who’d like to see it in the flesh. Miss Elizabeth Ryder’s several 1860s’ books on How To Knit Socks (and Stockings), which I used to help recreate the child’s sock, can be found here. It was quite appropriate, finding an 1860’s Yorkshirewoman’s child’s sock pattern, to go with this 1860 painting. I think the pattern will pop up on Knit’s blog, at some point in the not entirely distant future. The Knitting Genie about the sock should be in the xmas ‘Knit’.